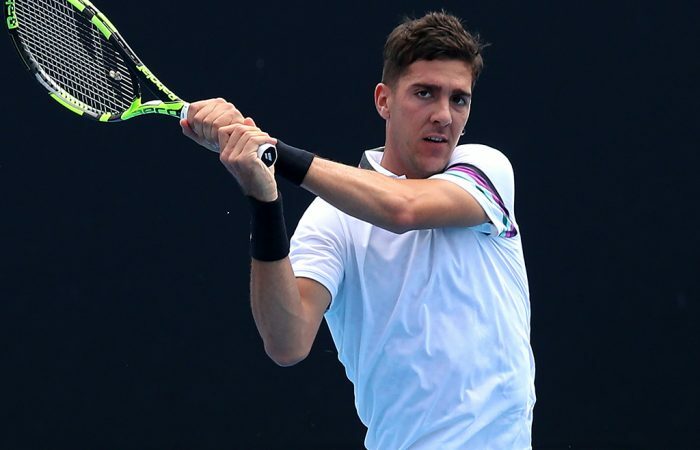 Thanasi Kokkinakis moves to within two wins of the Australian Open main draw after seeing off Mohamed Safwat in straight sets on Tuesday. 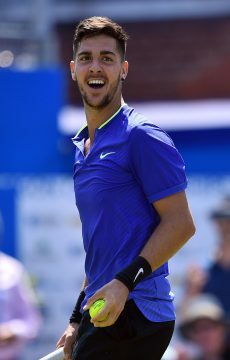 Thanasi Kokkinakis has advanced to the second round of qualifying for his home major on Tuesday, defeating Egypt’s Mohamed Safwat 6-2 7-6(4). 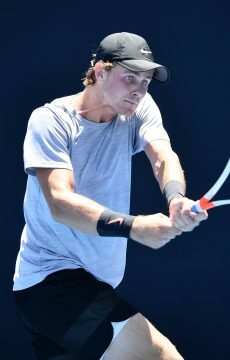 The 22-year-old stands just two wins away from a main-draw berth at Melbourne Park, where he reached the second round as a teenager in 2014 and 2015. 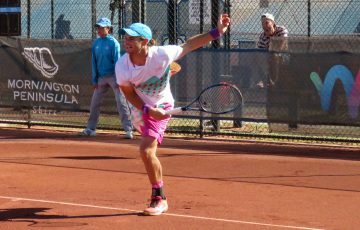 Unfortunately, Australian youngsters Rinky Hijikata and Blake Ellis were unable to join Kokkinakis in the second round after both fell in three sets. 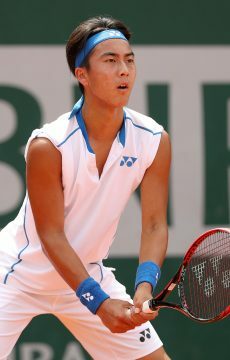 Hijikata, 17, battled gamely yet fell to world No.185 Hiroki Moriya 7-6(4) 2-6 6-3, while 20-year-old Ellis lost to Germany’s Dominik Koepfer 3-6 6-0 6-3. Fellow Aussies Aleksandar Vukic and Alexander Crnokrak also lost their first-round matches, but put up impressive fights. Kokkinakis struggled to put away first-time opponent Safwat, notably breaking a string on the first of three match points, before prevailing in an hour and 47 minutes. “I feel like I should have done it easier, but he’s a tough player, he’s sneaky good. “At the start I was playing such a high level, but it was only points from it being 4-0, which it was, or 2-2. It wasn’t anything flashy from me, but I made him play a lot of balls. “I had a lot of chances in the second which I didn’t take, I got a bit nervy at the end. To break a string at match point was pretty frustrating, which was worse after I couldn’t find the court for another three games. 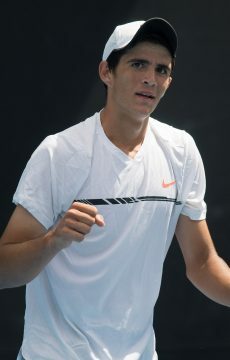 Kokkinakis will face Austria’s Sebastian Ofner in the second round. “I have a lot of motivation here, but I have to try and find the balance between playing calm and being too fired up,” he admitted. The South Australian has grappled with knee soreness in recent months but said it had not significantly impeded him on the court. 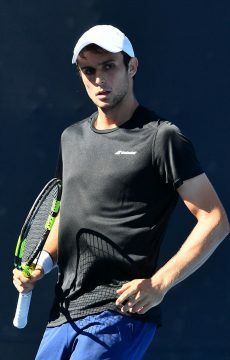 After battling injuries, most notably shoulder issues, Kokkinakis was granted a wildcard into last year’s Australian Open but lost a four-set match to Russian Daniil Medvedev. He hasn’t returned to the main draw of a major since, falling in qualifying for the 2018 French Open, Wimbledon and US Open. “A lot of times I can be very up and down. When I’m up, I’m very good, when I’m down I’m not so good. I need to find a balance and keep going,” he said. 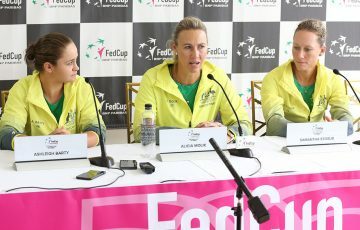 “Qualies is tough, there a lot of good players here. Getting through three matches will not be easy. I can look ahead sometimes, but I need to take it one match at a time and really focus. If you lose focus it can get yucky. “The body is feeling good. I was a bit limited in what I could do in the off season. It was less on court specific stuff and more focus on my rehabilitation, trying to get my conditioning up and I think it’s paid off. 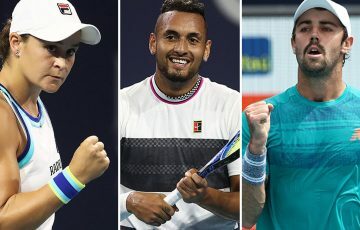 Kokkinakis said he had been seeking advice from Darren Cahill, the former coach of Andre Agassi, Lleyton Hewitt and Simona Halep. Two more Australians, Isabelle Wallace and Aleksandar Vukic, are currently on court at Melbourne Park.